Enjoy a slice of Chocolate-Peanut Butter Ice Cream Cake after dinner. 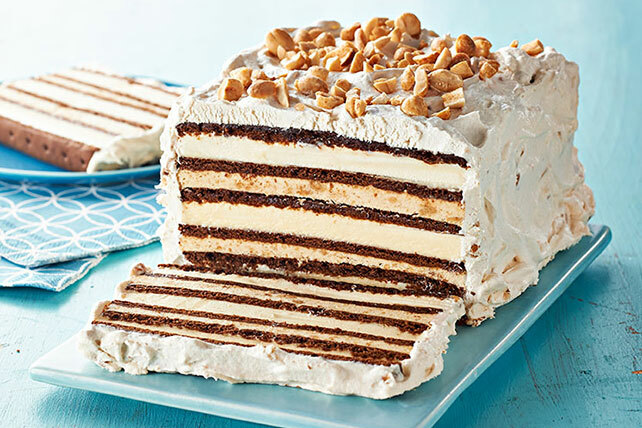 This Chocolate-Peanut Butter Ice Cream Cake is sure to sweeten up your day! Arrange 4 ice cream sandwiches, long sides together, on 24-inch-long sheet of Reynolds Wrap® Aluminum Foil; top with half the pudding mixture. Repeat layers. Top with remaining sandwiches. Mix remaining peanut butter and COOL WHIP until blended; spread onto top and sides of dessert. Freeze 4 hours or until firm. Top with nuts before serving. Prepare using chocolate ice cream sandwiches. Let frozen dessert stand at room temperature about 10 min. before slicing to serve.